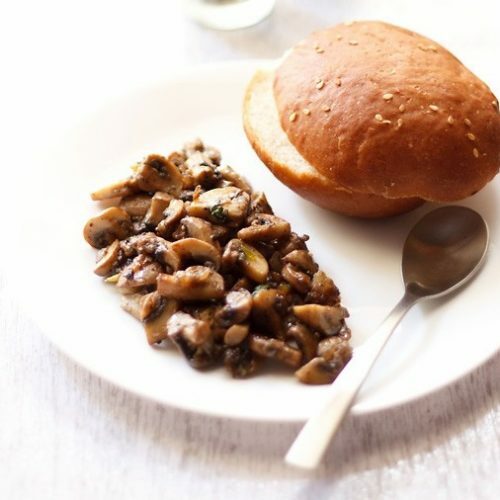 Italian Garlic Mushroom Recipe in Olive Oil - Garlicky mushrooms sauted in olive oil and seasoned with mixed herbs. Rinse the mushrooms well. Drain. Then chop or slice them. Keep aside. In a pan, heat the olive oil. add garlic and saute it for about 30 seconds to a minute. no need to brown the garlic. You can add the chopped onion at this stage and saute them till they are translucent. Now add the mushrooms. saute the mushrooms. the mushrooms will loose water and shrink in size. Add the black pepper powder, mixed herbs and salt. Mix these well with the mushrooms. When the mushrooms are well browned and have enough shrunk in size, it means they have got cooked. There should be no trace of moisture or water in the mushrooms. The mushrooms should be sauteed till they become golden from the edges or sides. Keep on stirring while sauteing them, for a uniform color. Remove the garlic mushroom from pan and serve with garlic bread. You can also put a topping of the garlic mushroom on the garlic bread. Another option is that you can top the mushrooms with grated mozzarella or cheddar cheese and bake or grill in the oven till the cheese melts. You can also serve the garlic mushroom wrapped in tortillas. Or you could also serve it with rotis or toasted bread or even buns. This dish can also be served as a side dish. 1. This recipe can be doubled as well as tripled.